How do I make the player randomly teleport between doors? What I need is entering to the door 1, then getting out on, ideally, door 2 or 3, but any of the 3 will do for now. 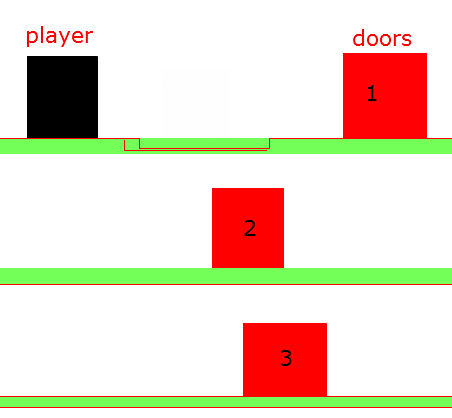 When the Player is overlapping Doors, press a button then set position Player to Doors UID's X and Y. But I have no idea how to randomly take one of the 3 UID. I tried with a variable but it says "variable is not an object name". Note: it's very important that the UID is randomly selected everytime I press the button, not on start of layout. You could store the UID of each door in an array then pick it randomly from there.. I kinda have a "NO ARRAYS PLEASE" philosophy so I try to avoid them like the plague, lol. Lordshiva1948 It's really similar to what I want, but as much as I try, I can't make it work with only one object. I replace tr with spawn and it always comes out in the same place. Then do it otherwise, I add the instanced variables to tr, and the same thing happens. It always comes out on the same "door". I want to avoid using two objects for this, else I would have to overlap them and then make one of them invisible. Could also create other issues, I think. Easy enough, use the system choose parameter. Sorry, I'm at work. If you need a Capx example then let me know. I'll do it late tonight or tomorrow morning (eastern time). Thanks for the help guys, but this still doesn't work as intented. Maybe I wasn't clear enough but I need to use only one object besides the player. There's no point on having duplicates of duplicates. I tried using variables now but I don't know if to use instance variables or global variables. 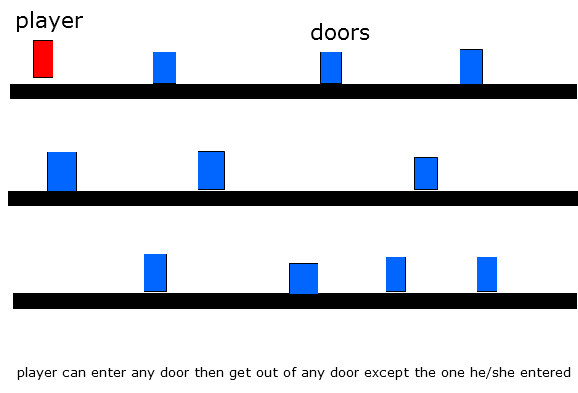 Or how to select a specific door (because the action should be triggered with Any door or I'll turn more crazy) Any help appreciated. Well, notnsane, I think I've got what you want. I even kept your colors. The player has platform, press down to go through a door. What it actually does is teleport the player to a random door including the one he started at, but moves him again if he would appear at the original door. The UID of the origin door is stored as a separate instance variable in the player, and compared against the destination door. What's handy about this over the Choose(1,2,3....) version is that you can dynamically add or remove doors to your heart's content*, and it won't change the algorithm at all. You can even just drop it down to two doors to verify that it'll never drop you back at the door you started at. You may note that the doors and floors all have physics. Frankly, that was easier than aligning them all with the floor manually. You can remove them and it'll still work just fine. Edit: Sod, left a bug in there. If you walked to a door after teleporting from it, you'd teleport again. *Provided your heart's content doesn't include a single door. That will cause an infinite loop. That's fantastic, unnatural20, exactly what I was looking for. It seems that the task was quite complex, considering the events' logic. It took me a while to understand it completely and I'm still confused about the sub events... but it makes sense. I also tried to nest or "de-nest" the sub events but it only worked correctly the way you nested them. Absolutely not, this teaches me more about Picking! notnsane Picking, inside of a single event, happens from the top down. Last, one random door of the remaining set is picked, and the Mans is moved to that door. However, unlike in my .capx, this only occurs when the down key is pressed and Mans is overlapping a door. v. efficient.